A blog about wood smoke and local risks on Gabriola Island BC. To see our live PurpleAir sensor network click here. To promote protection of the air shed on Gabriola Island and Vancouver Island region from smoke and other airborne pollutants. To work with other organizations including local, provincial and federal governments to improve air quality by identifying current, emerging and future threats that may compromise public health and/or the environment. To work with organizations and governments to reduce risk from outdoor burning practices, wood smoke from wood burning appliances, and to help develop voluntary initiatives, bylaws, and enforcement recommendations. To perform educational and outreach functions to increase understanding of these threats to air sheds. Thank in large part to people who burn yard waste, and still operate their wood stoves in late April, Gabriola Island currently has the worst air quality in North America. The 232 micrograms/m3 reading on the map is our island. This level of PM2.5 is almost ten times the provincial maximum based on a 24 hours average. Do N95 masks work to protect you and your family from wildfire smoke? 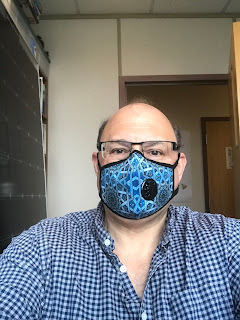 Dr. Michael Mehta of TRU wearing a Vogmask. Yes, I've heard the jokes about Darth Vader and Silence of the Lambs. Over the past two years people in many parts of British Columbia have been exposed to unusually high levels of particulate pollution from wildfires. The messaging from the BC Centre for Disease Control (BCCDC), and public health officials from Interior Health and other publicly funded health care providers, has been mixed and noticeably negative about the benefits of wearing N95 respirator masks as a risk reduction measure. With air quality changing rapidly, and awareness of the risks from air pollution increasing daily, here's a handy reminder of how good the Purple Air network truly is. In Kamloops, British Columbia, the provincial government has only one air monitoring station for the entire region. It is located downtown on West Victoria Street, and incidentally away from some of the largest industrial polluters. A Purple Air sensor happens to be co-located near this provincial air monitoring station, and it is within 200m of it and at a similar elevation from the ground. Here's what the provincial readings look like recently for PM2.5 levels. And here is a graph from the co-located Purple Air sensor. If you focus on the graphs between April 4-10 (the Purple Air graphing package only shows one week at a time), you'll see that the pattern is virtually identical and readings are extremely close. As many of you likely know, there have been several small wildfires recently in B.C.. With a strong El Nino oscillation this year, we predict that this Summer may be worse than what we’ve experienced to-date in terms of air pollution. It’s sometimes difficult to make sense of the numbers and metrics used to explain air pollution. We came across the following website that helps show visually the differences between these levels, and are attaching some screenshots from this website. 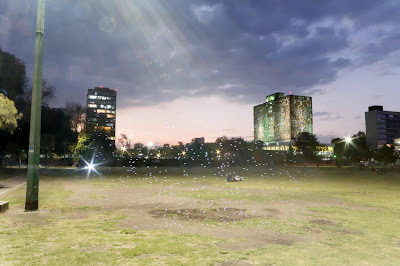 With respect to PM2.5 sized particles, the World Health Organization is recommending an annual average of 10 micrograms/cubic metre or lower. Below is a representation of this level. The Province of British Columbia has a target (not even a regulation) of 25 micrograms/cubic metre for a 24 hour period. At points during the Summers of 2017 and 2018, we had daily averages exceeding 500 micrograms/cubic metre in the interior and north of the province. Wood smoke, and the cultural and social practices that allow it to be generated without much regulation and control, operates in a vacuum where preconceptions, origin stories and strong emotions impair action. We need another narrative. Lack of government action to deal with this problem encourages people to ignore this evidence and to underestimate the risk. Burning wood deprives people of the right to breathe clean air in their own homes, and it ultimately represents an uncontrolled form of secondhand smoke exposure with broad implications. For those who experienced a Summer exposed to wood smoke from forest fires, the thought of yet another Fall, Winter, and Spring filled with locally-produced wood smoke from fireplaces and wood stoves is a horrifying one. Many are now exposed to particulate pollution for virtually 12 months of the year, and in rural and semi-rural communities these exposures are usually higher and almost never recorded by local, regional, or national governments. Our PurpleAir network shows the impacts of larger scale fire events as well as hyper-local impacts associated with residential wood burning practices. The pattern of smoke generated is clear and easy to interpret. Below is ambient air pollution from forest fires over the past week. This PurpleAir sensor is located in the Kamloops region. 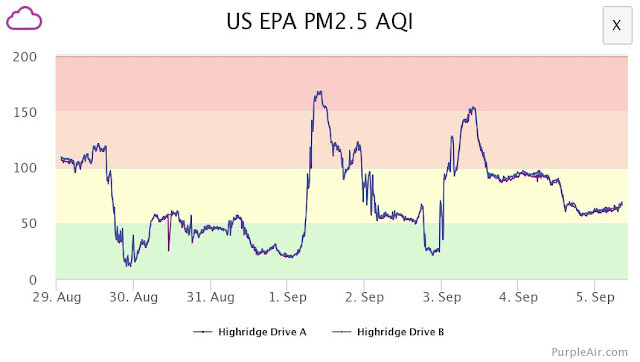 This pattern of smoke has a roller coaster appearance, and in this case PM2.5 reached around 165 on the US EPA AQI scale. Is the indoor air quality at Thompson Rivers University in Kamloops safe? Forest fire activity in the Province of British Columbia and elsewhere during the Summer of 2018 has once again raised concerns about air quality and human health impacts. Although the Summer of 2017 had longer and more intense wood smoke pollution events in communities like Kamloops then this year, this Summer has seen larger spikes in pollution. For a comparison of the two summers and for a discussion on the implications of multiple years of smoke exposure, click here. On August 23, 2018, smoke in the City of Kamloops returned with a vengeance. 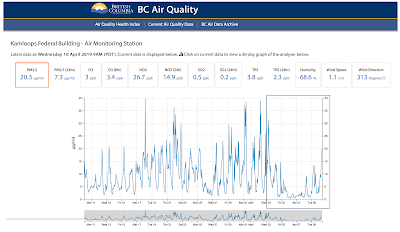 The provincial air monitoring station at the Federal Building in downtown Kamloops recorded a one hour average for PM2.5 of 231.1 micrograms/m3 at 10PM.